The last several days have held some beautiful weather but those same days have have produced fewer fish than we would like due to erratic fishing in Ft. Lauderdale. We have had some nice fish as you can see by the photos accompanying this report, but catching has been on some days has been off. We are fishing in basically flat calm waters with little current and even less wind. Water clarity has not been bad once out off the reefs and 82 to 84 has been a typical high temperature. 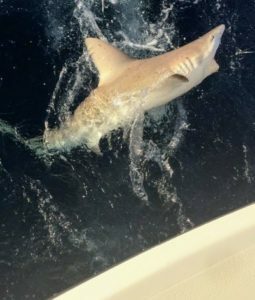 The Kings have been very scattered on the reefs and we have done the best on them south of our inlet and in the Hollywood area. 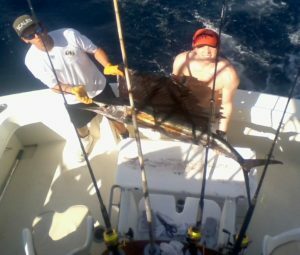 Slow trolling live Bally-Hoo as bait has gotten Sailfish into the picture but it can be a long time between bites. Cleaner water has been best as it often is but Sails aren’t at all hesitant to venture into greener water, especially on strong current days. The slow current has had us spending a lot of our time mostly just off the edge, and the water is cleaner there. Blackfin tunas have taken those Bally-hoo as well and they are good fun on light tackle. We have caught them trolling too and later in the day is once again best. Some medium to large Bonito getting in on that also. Grouper action has been slowing considerably and Snappers have proven difficult as of today with the exception of one spot we have that has been thankfully strong. 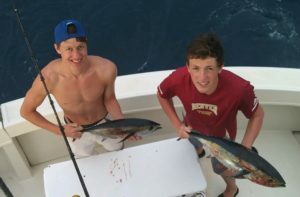 Almoco and Greater Amberjacks showing still on deep wrecks. Golden and Gray Tilefish are biting, but again be prepared to often have a spell between bites, but they have been good fish. Flat calm seas and light north current are typically a good mix of conditions for them. Flat calm seas and a slight south current often is a mix with poor results. Some Sharks in with the Snappers and Tiles.